The Tibetan Book of the Dead presents a map of the mind using imagery. It is a direct and elemental vision, doing honor to the power of the mind, rather than fearing it or reducing it. It is the power of imagination, the irrational, the creative spirit. The power of nonthought and holding mind still through tumultuous changes. Filled with images of peaceful and wrathful deities, bright lights and elemental transformations, The Tibetan Book of The Dead is a journey through an hallucinogenic and colorful world of the imagination, a journey from the height of spiritual illumination toward a progressive solidification of habitual patterns. It is a journey we repeat over and over—from moment to moment, from day to day, from life to life. Emotionally charged, the journey calls for heroic reserves of courage and the need to see dearly in the midst of horrifying and panic-inducing visions. In this journey, rather than slaying mental demons, the traveler must recognize the nature of his or her own mental projections in order to be liberated. Bardo is “between.” We are always in transition. Spiritual tradition is a powerful support through the difficult transitions, preparing ourselves through diligent training is of great help, working with a teacher is essential, but ultimately, we can only deal with the nowness of each passing moment—its color and shape, its wisdom and confusion. 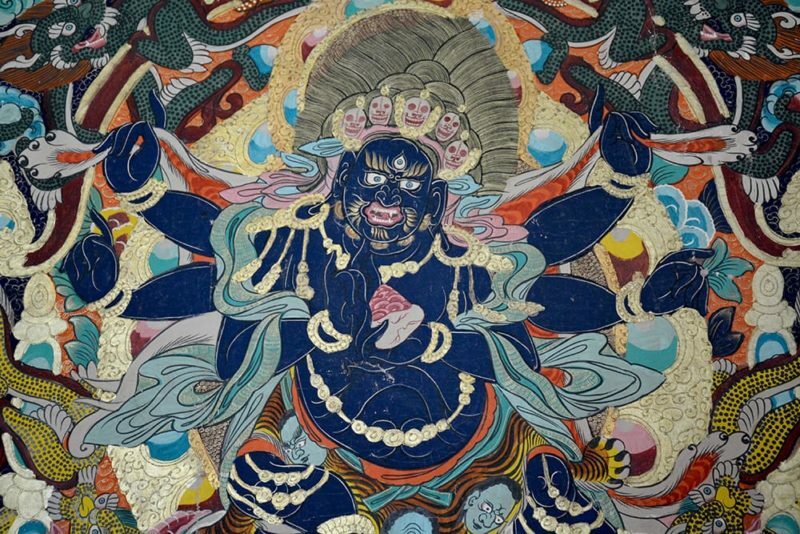 The Tibetan Book of the Dead is a powerful guide for living and dying. It was one of the first works of the Tibetan Buddhist tradition to become part of popular Western culture, and it has had continued appeal, far beyond the many other Tibetan texts now available. For many people, it has provided the doorway to the profundity and vastness of the Tibetan tradition. The text has universal appeal and speaks to common human experience. Yet in many ways it is esoteric, based on a body of knowledge, language of discourse, and vigorous spiritual training most readers have never encountered. It is definitely a text that requires explication and study to unlock its power. A translation by Francesca Fremantle and Chogyam Trungpa came out in 1975, with an emphasis on simple, direct language and the practical application of bardo teachings in everyday life. 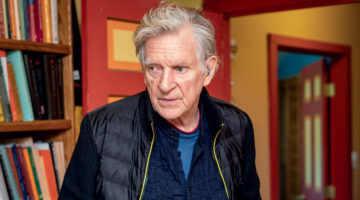 The current translation by Robert Thurman, Professor of Indo-Tibetan Studies at Columbia University, interweaves text and commentary by Dr. Thurman. Emphasis is placed on studying the text as a preparation for one’s own death and reading the text aloud as a help for others. For the serious student, it would be valuable to read all three translations, as they present different perspectives on the text and on the meeting of the text with western mind. Professor Thurman’s translation includes a concise history of Tibet and an introduction to some of the key concepts in the book, such as bardo (which he translates as “between”), the six realms, the three Buddha Bodies, the five Buddhas, and the stages of death. 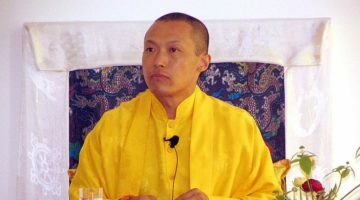 He also has translated two supplementary texts: a visualization text entitled “The Dharma Practice, Natural Liberation of the Instincts,” and a maha ati philosophical text, entitled “The Natural Liberation through Naked Vision, Identifying the Intelligence.” His decision to include a liturgical text and encourage people to take up visualization practice without a teacher, preliminary training, further study, or initiation, is a controversial step. So is his suggestion to simply substitute religious or heroic figures one is familiar with for the deities in the text, if that seems helpful. Professor Thurman states that his goal was to make a more “clear, usable, and accessible” translation, one that is “simple and useful, easy for bereaved relatives to read, easy for lost souls to hear.” He encourages the reading of the text at the time of death, much as was done in Tibet. To facilitate that, he highlights in boldface those passages meant to be read aloud. In contrast to Professor Thurman, Chogyam Trungpa placed emphasis on developing the mental stability that would allow one to connect with the dying person, and then transmitting the text conversationally, in one’s own words. Trungpa Rinpoche also stressed the great importance of direct exposure to and familiarization with death as essential training. Translators are always faced with the decision whether to translate key terms from Sanskrit or Tibetan into English, or bring them into English directly as loan words. In general Trungpa and Fremantle chose to keep technical terms as loan words, for instance bardo, guru, dharmata, and karma, which Thurman translated as “between,” “mentor,” “reality,” and “evolution,” respectively. Thurman has coined a number of colorful new termsTas well, including “psychonaut,” and “bud- dhaverse.” The effect of the translators’ respective decisions can be seen in the following key passage in the book. Hey, Noble One, you named So-and-so, listen here! Now the pure clear light of reality dawns for you. Recognize it! Hey noble one, this, your present conscious natural clear void awareness, this presence in clear voidness without any objectivity of substance, sign or color— just this is the reality, the Mother, Buddha All-around Goodness! And this, your conscious awareness natural voidness, not succumbing to a false, annihilative voidness, just your own conscious awareness, unceasing, bright, distinct, and vibrant—just this awareness is the Father, Buddha All-around Goodness! Just this presence of the indivisibility of your awareness’ naturally insubstantial voidness and the vibrant bright presence of your conscious awareness—just this is the Buddha Body of Truth. Your awareness thus abides in this vast mass of light of clarity-void indivisible. You are free of birth or death—just this is the Buddha Changeless Light. It is enough just to recognize this. Recognizing this, your own conscious awareness’ purity nature as the Buddha, yourself beholding your own awareness—that is to dwell in the inner realization of all Buddhas. O Son of Noble Family, (name) listen. Now the pure luminosity of the dharmata is shining before you; recognize it. O son of noble family, at this moment your state of mind is by nature pure emptiness, it does not possess any nature whatever, neither substance nor quality such as color, but it is pure emptiness; this is the dharmata, the female buddha Samantabhadri. But this state of mind is not just blank emptiness, it is unobstructed, sparkling, pure and vibrant; this mind is the male buddha Samantabhadra. These two, your mind whose nature is emptiness without any substance whatever, and your mind which is vibrant and luminous, are inseparable; this is the dharmakaya of the buddha. This mind of yours is inseparable luminosity and emptiness in the form of a great mass of light, it has no birth or death, therefore it is the buddha of Immortal Light. To recognize this is all that is necessary. When you recognize this pure nature of your mind as the buddha, looking into your own mind is resting in the buddha-mind. Chogyam Trungpa described the Davor of the original text as simple peasant language. And Professor Thurman expressed his intent to do a simple, useful translation, easy to read and to hear, more clear and accessible than previous translations. Yet to my ear Thurman’s translation is more scholarly than simple, and would not be particularly easy to read or to hear. Nor would I personally relish being called “Hey, you” over and over by some benighted text reader. Professor Thurman’s translation, particularly his historical remarks and commentary, is a valuable addition to the literature. The interweaving of text and commentary should be especially helpful to a new reader. The Tibetan Book of the Dead is an acquired taste, and grows deeper and richer with each re-reading. I hope that Dr. Thurman’s translation will open the door of this wonderful treasury for a new generation of psychonauts.